After one of the mildest winters in a long time, the snow levels in the mountains are unusually low and melting fast. With this warm spring weather, we are all looking forward to getting back up in the mountains and on the Great Divide soon! This year we are partnering with the Hornaday Wilderness Society to repair damage to the trail caused by the floods of 2013 and re‐establish the GDT from Aldridge Creek trailhead to Fording River Pass. We will be repairing and building trail tread, removing brush and fallen trees, marking the trail, and performing riparian restoration as required. For those of you new to trail building and maintenance, this year’s trip will include a tool use and safety orientation so previous experience is not required. Let me know if you are interested in participating in the 2015 GDTA Trail Maintenance Trip or if you’re not able to participate on the actual trip dates but would like to help with some of the pre-trip planning activities. We can use your help! On EARTH DAY, Wednesday, April 22nd at 7:30pm, check out the GDT presentation at the University of Calgary Outdoor Centre in Room KNA160 (Kinesiology Department) at the University of Calgary, 2500 University Drive NW, Calgary. 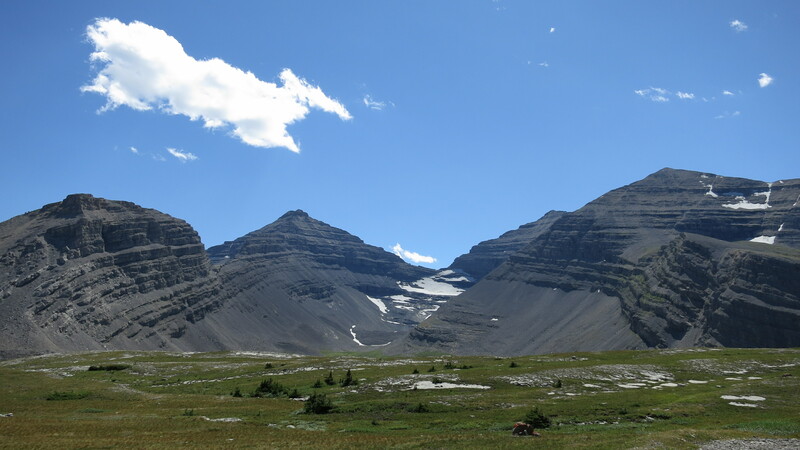 On Tuesday, April 28th at 7:00pm, learn about volunteering with the GDTA at the Alberta Wilderness Association office, 455 ‐ 12 Street NW, Calgary. On Friday, May 15th from 1:00-3:00pm at the Calgary Winter Club, 4611 14 St NW, Calgary. Thank you to the Yellowstone to Yukon Conservation Initiative for supporting our 2015 Aldridge Creek Trail Maintenance Trip with a $1,000 grant! We are honoured and appreciate the help connecting our wilderness trail in the Y2Y corridor. Thanks to Suncor Energy Inc. and Jean-Francois Cianci for the generous contribution of $750 through the SunCares Community Service Volunteering Grant! And thanks to the North Face for their continued support of our annual trail maintenance trips! When I first got involved with the GDTA I did not realize that I had already hiked many of the kilometers of this trail! Possibly you have too? 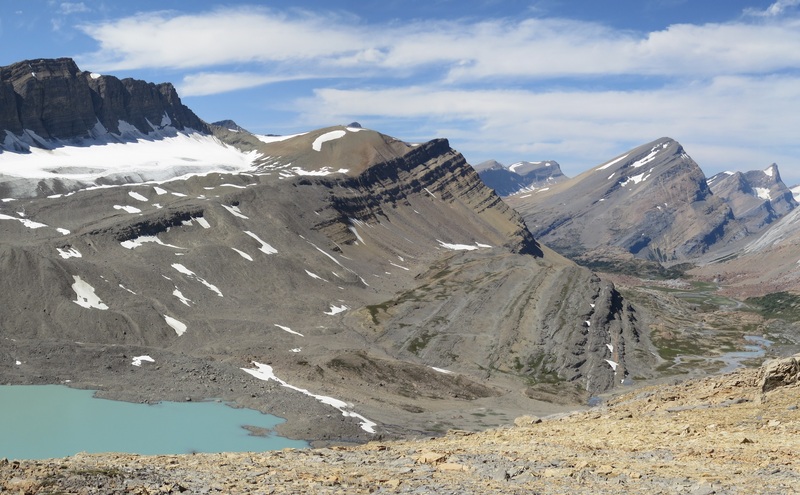 The other surprising fact was that there were many, many more spectacular hikes and mountain views that await us who are game to attempt the other lesser known parts of the Great Divide Trail. The first mountain in this short feature is Tornado Mountain, as it is front and centre in the logo of the GDT. Tornado Mountain is located on the Great Divide at the headwaters of Dutch Creek, Hidden Creek and Tornado Creek. Though you get much closer to this beautiful peak on the GDT, you can also see it from where Highway #22 now crosses on the Oldman River Bridge. If you are hiking the GDT, you will encounter this peak in the Coleman to Kananaskis section of the trail as described by Dustin Lynx in his book ‘Hiking the Great Divide Trail.’ At 3,099 metres, it is part of the High Rock Range (also known as the Tornado Group), which lies parallel and to the west of the Livingstone Range. Originally named in 1858 by Thomas Blakiston as Gould’s Dome (John Gould was a British ornithologist much admired by Blakiston), it was renamed in 1915 by Morrison Bridgland of the Interprovincial Boundary Surveyors. The experiences of Bridgland and his associate Arthur O. Wheeler on the mountain resulted in their attaching the appellation ‘Tornado Mountain’. 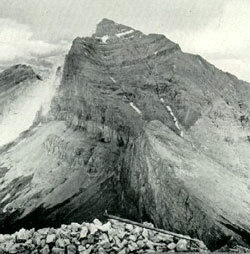 To quote their report “Tornado Mountain is a storm centre of the locality and, on the occasion of two ascents, the party had narrow escapes; first, through a cloud-burst accompanied by sheets of hail, which caused the mountain to run wild, torrents of water cascading down its slopes in every direction, and rockfalls, loosened by the water, crashing on all sides; on the second occasion, a fierce electrical storm encircled the summit and severe shocks were felt by members of the party”. In 2014, without any of the furor of Tornado Mountain affecting them, the GDTA trail crew repaired the trail which crosses the saddle of Tornado Mountain, one of the highest points on the GDT at 2,445 metres, a delightful alpine pass below the giant rock buttresses and chimneys which make Tornado Mountain so beautiful. Read more about this mountain on Peakfinder. To continue on the dehydration trail food tips, we’re getting saucy in this issue of Pathfinder! Sauces are simple and can make great use of leftover sauces or can translate a single jar of sauce into many delicious do-it-yourself wilderness feasts. Step 1: Buy a jar of sauce (tomato based is good, nothing too oily or dairy based but chunky is okay) or make your own. Step 2: Fire up your dehydrator to a medium-high setting. Step 3: Lay out a sheet of parchment paper or Paraflexx paper on your dehydrator tray. Step 4: Pour sauce slowly over parchment paper and using a spatula or large spoon begin spreading sauce along paper so that it is even and smooth until it is the thickness of a toonie. Step 5: Put tray in your dehydrator and let it work its magic until the sauce is no longer sticky to the touch and pliable (6-10 hours). Step 6: Peel sauce away and store until needed. You will need about a 1/4 cup of packed sauce strips to fulfill your saucy needs in a pasta dish for 2. To Rehydrate: Add sauce flakes to 1 cup of warm to boiling water (I like to put it into my leftover pasta water) and mix until rehydrated. BONUS TIP: Blend your choice of fruits (include an apple) and use the same methods to make your own fruit leather! Spring is transition time on the GDT. Hiking trails at lower elevations vary from bare and muddy to slushy and icy, while trails at higher elevation remain snowbound with potential avalanche risk. Trails can be icy in the morning but warm daytime temperatures are creating slushy and slippery conditions. Snowshoes, cleats and/or poles are recommended for hikers. There has been some recent late season snowfall in April and avalanche conditions still exist, especially at higher elevations so always check the latest avalanche bulletins before setting out. Tick season has started. Be extra careful when in areas with a lot of underbrush and check yourself and your clothing after your hike. Annual Winter Closure of Forestry Trunk Road 940 from December 1 to April 30, from Cataract Creek Campground to the junction with the Plateau Mountain access road. Annual Winter Closure of Highway 40 from the Kananaskis Lakes Trail to the junction of Highway 541 between December 1 and June 15. Construction work continues from South of the winter gate to Junction Highway 541. Annual Winter Closure of Highway 532 from December 1 to April 30, west of the staging area of the Indian Graves Campground to the intersection of the Forestry Trunk Road 940. GDTA Membership – We need you! Anyone planning to hike on the GDT this year, please let us know if we can be of assistance with your trip-planning. Check out the Trip-Planning Resources on our website for maps, trail conditions, resupply information and much more. We’re happy to help!